Pulse is normal distance: 尺 is 1 cun, distance of 寸 is nine fen, distance 尺寸 is about 2 cun. 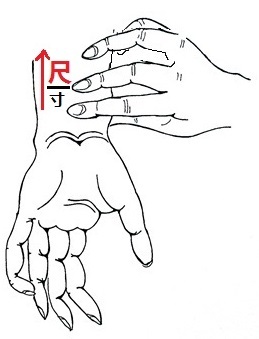 Pulse of yin victory: 尺 is 1 cun, distance of 寸 is more then one cun, distance 尺寸 is more then 2 cun.This pulse is palpated easy in chi position. 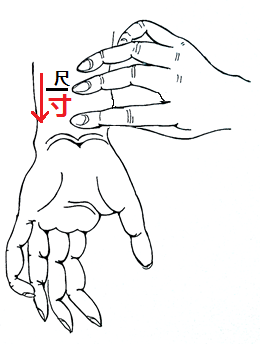 This pulse cant be palpated in normal cun position as it isn't fulfilling or force is reduced, index finger should move towards tenar, where it becomes stronger then usually between cunkou and cun positions, named overflowing.It is yin victory as yang cun position is pushed away by excessive yin. Pulse of yang victory: 寸 is 9 fen, 尺 is more then one cun, distance 尺寸 is more then 2 cun. This pulse is palpated easy in cun position. This pulse can't be palpated in normal chi position as it isn't fulfilling or hiding, annular finger should move towards elbow where it becomes stronger then usually, named as oveflowing. It is yang victory as yin chi position is pushed away by excessive yin. Knowing yin or yang victory we may conclude and treat true, full, dominating and not false disease.To find more how to find correct location of cun, chi and guang positions and their movement in acupuncture pulse diagnosis due to yin or yang victory or why patient becomes sick or dies during said abnormalities and much more you may be interested to take our seminar. This celestial qi flow was known in Chinese internal alchemy as source of celestial yin and yang. These yin and yang celestial alternations were known as yang dragon and yin tiger. Use of celestial qi flow of yang dragon and yin tiger is one of great advantages which acupuncture gives to practitioner for treatment of most complicated diseases. This celestial qi flow provides yin and yang feed of deficient yin or yang of patient in most natural way. Vasculitis can be defined as vascular inflammation which is usually immune mediated, leading to structural and functional damage to the vessel wall. Our concept of vasculitis has been built around the events surrounding immune-complex-triggered leukocytoclastic vasculitis, while the role of lymphocyte mediated vasculitis remains largely undefined. This may be due to maintaining a stereotypic image of lymphocytic vasculitis as one associated with vascular necrosis, fibrin deposition and haemorrhage and merely substituting lymphocytes for neutrophils. Our understanding of lymphocytic vasculitis may be advanced by identifying the clinical settings in which such reactions may occur, such as autoimmune skin diseases sharing features with graft vs host disease, as well as recognizing that lymphocyte mediated inflammation may lead to a morphologically distinct group of vasculitides, apart from those associated with angiodestruction. Lymphocytic endovasculitis, lymphocytic lichenoid vasculitis and granulomatous vasculitis are potential examples of lymphocytic vasculitis that differ from the histological pattern seen in association with immune complex leukocytoclastic vasculitis. 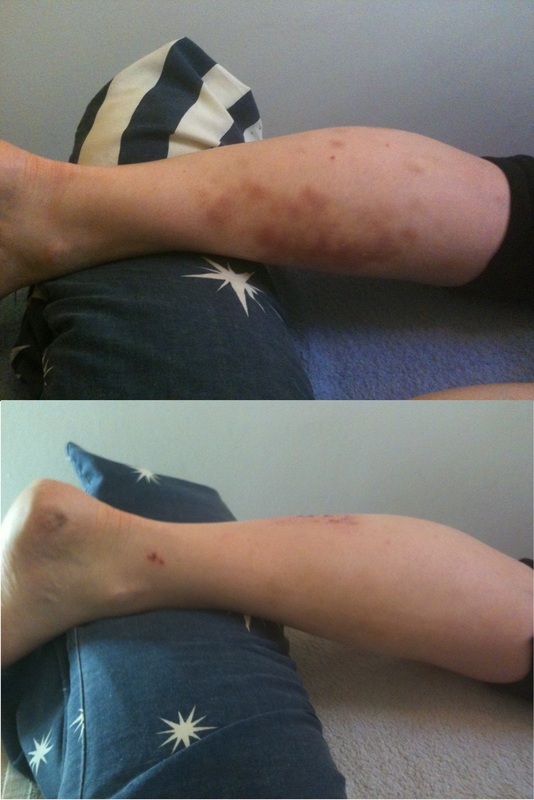 Sometimes, vasculitis doesn't respond well to treatment. This can lead to disability and even death. Patient has shown into the clinic with the history of ongoing for three month vasculitis with permanent rush around all the body with visible marks of inflamed vessels. 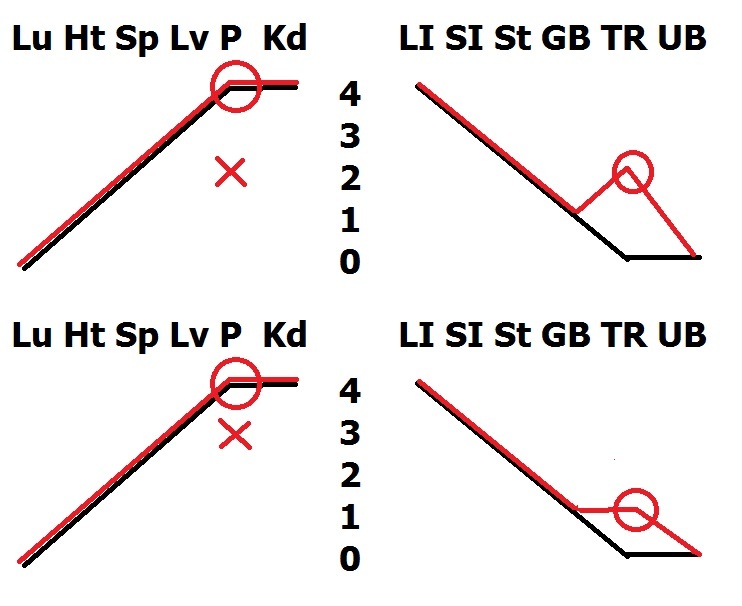 Acupuncture pulse diagnosis indicated yang excess in SanJiao meridian with dominating earth movement and as result yin excess in pericardium meridian with dominating water movement. Pulse of patient indicated celestial yin influence in time of visit, which was used for acupuncture of SanJiao meridian in the moment of 28.8 minutes yang meridians activity to decrease excess of yang and feed deficient yin. 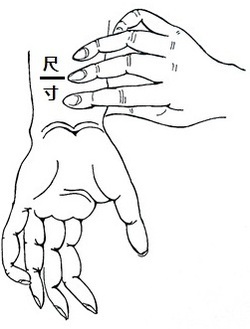 Acupuncture of wei of pericardium meridian was performed on the side of wei qi circulation together with yuan points of all yin meridians on the side of Rong qi circulation during the moment of 28.8 minutes of yin meridians activity and 5 Ren, Mu point of SanJiao was used same moment to feed yin to yin defisint SanJiao. Skin rush disappeared same day of treatment, inflammation of blood and lymphatic vessels gradually decreased during the week after the treatment.